DHA Enhance was recommended by a nutritionist for my son. This dose of DHA Enhance seems to be just right for him to take on a daily basis as he experienced difficulties with a higher dose in a different product. Shipping was immediate! Omega-3 fatty acids are essential to the overall health of people of all ages. DHA (docosahexaenoic acid) and EPA (eicosapentaenoic acid) work to support the brain by promoting better cognitive functioning. They may support cell health‚ the neurotransmitters‚ and the central nervous system. DHA in particular may also promote good vision by serving as a component of retinal cellular membranes‚ a part of the eyes. Finally‚ sufficient omega-3 fatty acid intake may promote healthy sleep patterns. Getting enough rest is essential in order for the human body to repair itself. This is especially important for young‚ growing bodies! Kids may also experience better respiratory health and increased immunity; the immune system support may be due to fish oil's potential to help maintain healthy cytokine activity. Kids that are less likely to feel sick are happier kids! Unfortunately‚ it's especially difficult to get children to eat enough of the cold water fatty fish that contain omega-3s; they may complain about the taste or odor. That's where a supplement like Pure Encapsulations' DHA Enhance may save the day. Each chewable softgel capsule provides pure‚ microfiltered fish oil derived from a variety of seafood: herring‚ anchovies‚ cod‚ sardines‚ tuna‚ and salmon. 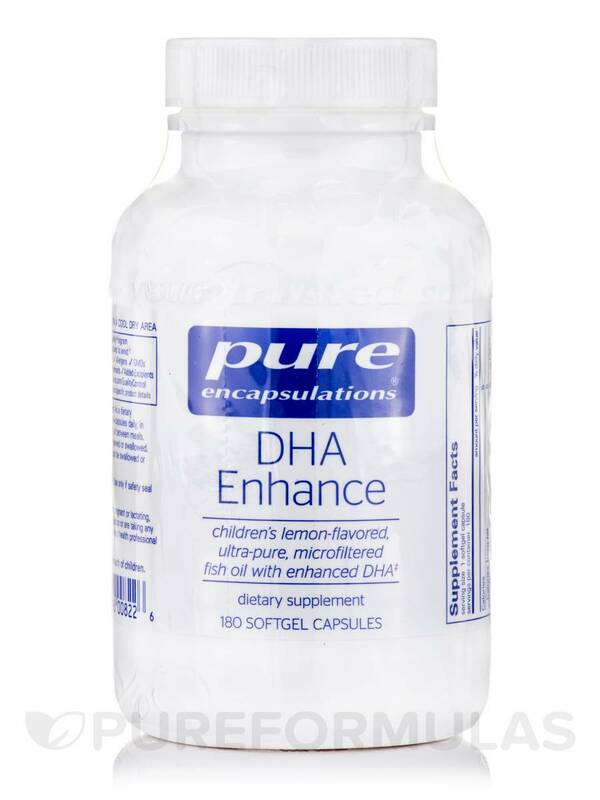 DHA Enhance has a natural lemon flavor to mask its smell and flavor. It's been enhanced to provide higher levels of DHA. Give your child one to four capsules of DHA Enhance by Pure Encapsulatons daily‚ in divided doses either with or between meals. Your child doesn't even have to swallow the capsules; after chewing fully‚ he or she can spit them out and still experience the benefits. 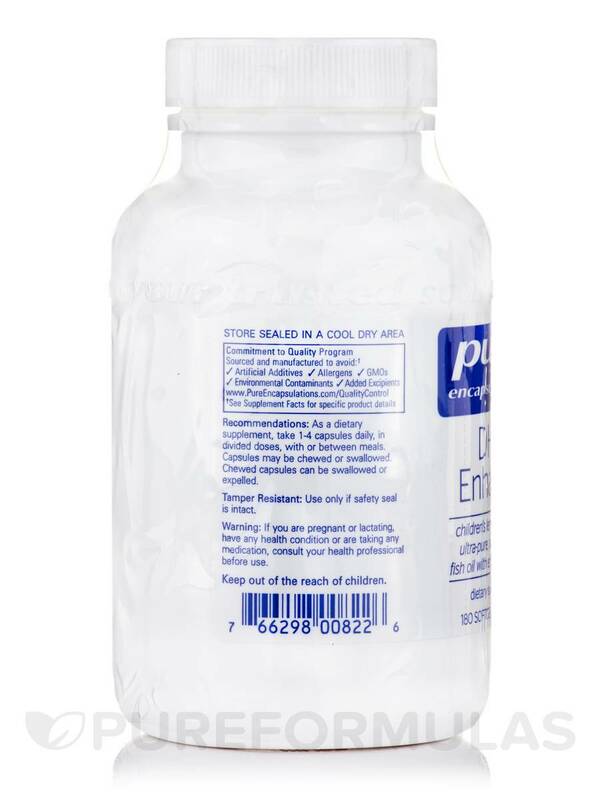 Other Ingredients: Natural lemon flavor‚ proprietary antioxidant blend (rosemary extract‚ ascorbyl palmitate‚ natural tocopherols)‚ gelatin capsule (gelatin‚ glycerin‚ water). Contains Fish (From Anchovies‚ Herring‚ Sardines‚ Tuna‚ Mackerel). 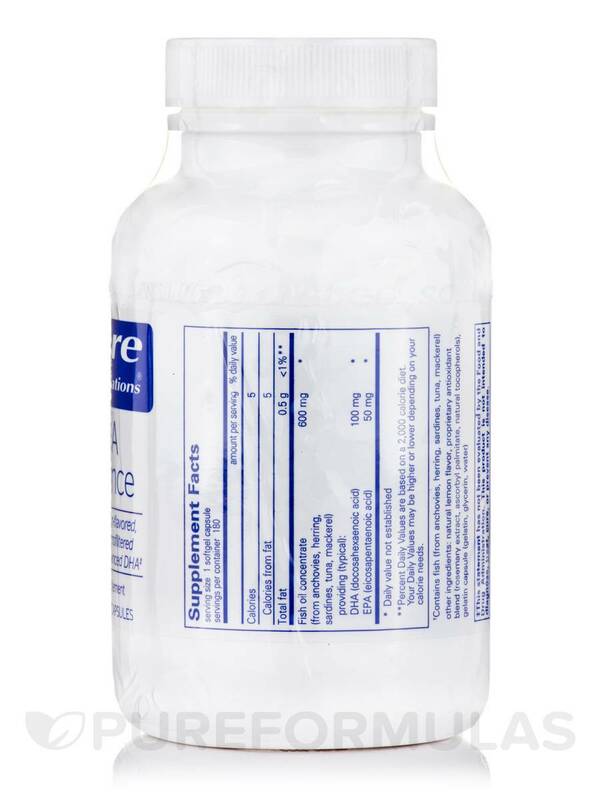 As a dietary supplement‚ take 1-4 capsules daily‚ in divided doses‚ with or between meals. 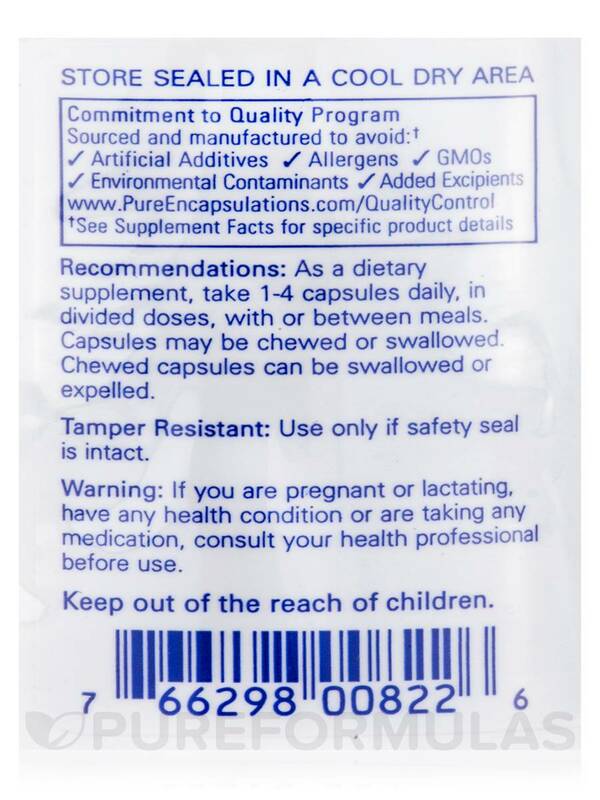 Capsules may be chewed or swallowed. 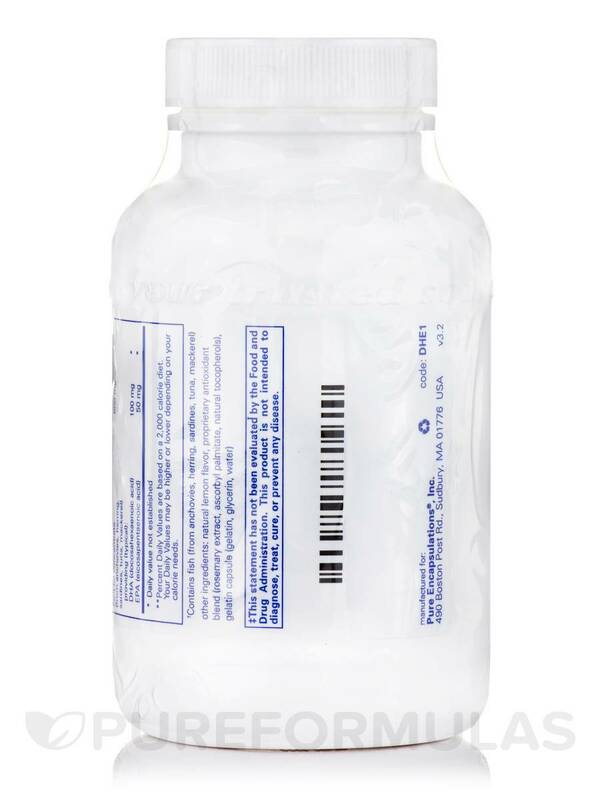 Chewed capsules can be swallowed or expelled. 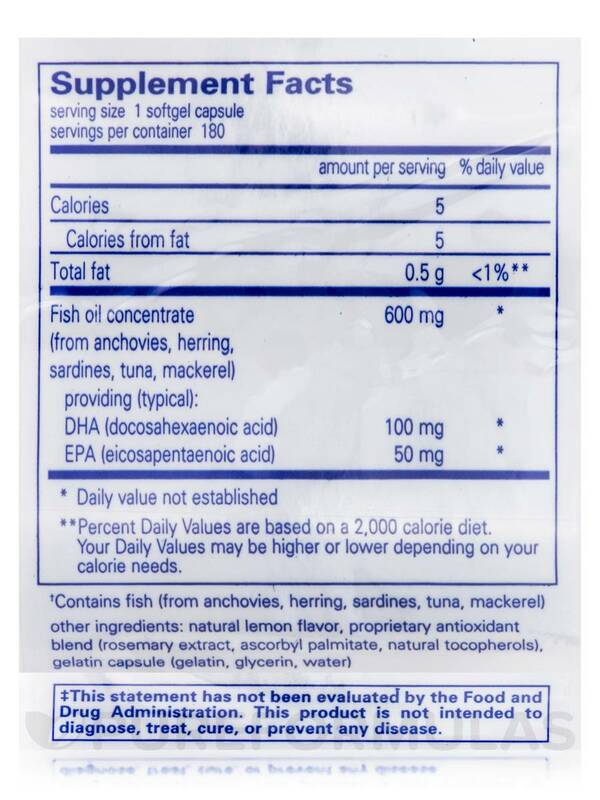 Allergen Caution: Contains Fish (From Anchovies‚ Herring‚ Sardines‚ Tuna‚ Mackerel).